Wait for this to finish before you continue. This will create the file, sfcdetail.txt on your Desktop and the .bat file icon will self delete. Please attach this to your next post. Many thanks I will follow the your steps and those in the Microsoft link and let you know what happens 2moro, it's late in the UK now so off to bed. Again thank you. Hi again DonnaB. I have followed your instructions and sfc /scannow is successful however, tried a few times but on all occasions it appears I have created sfcdetails.txt (saved in my documents) but there is nothing in that file when I open it and it does not appear on my desktop. I assume i've done something wrong but I honestly followed your instruction exactly. I have more trouble with that silly command! Go to your Start menu and type cmd into the Start Search field. 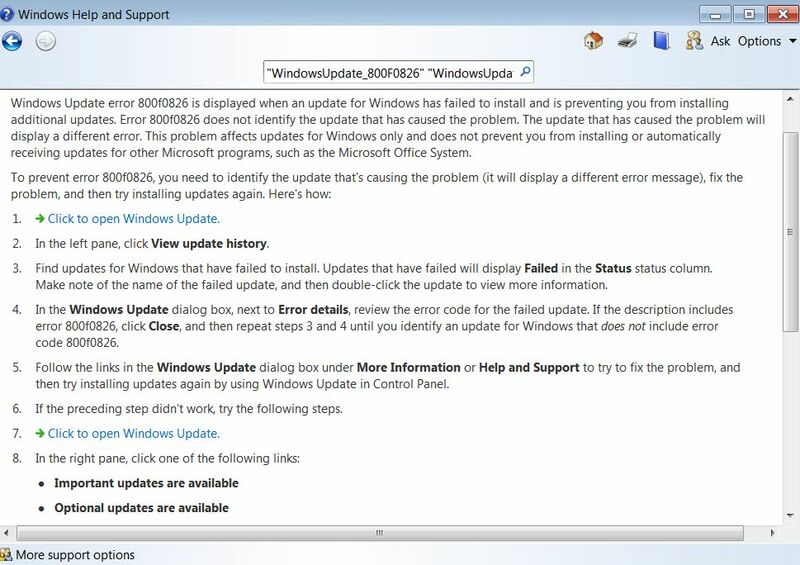 On a side note: It would be beneficial to run System File Checker a couple of times to fix any corruption. 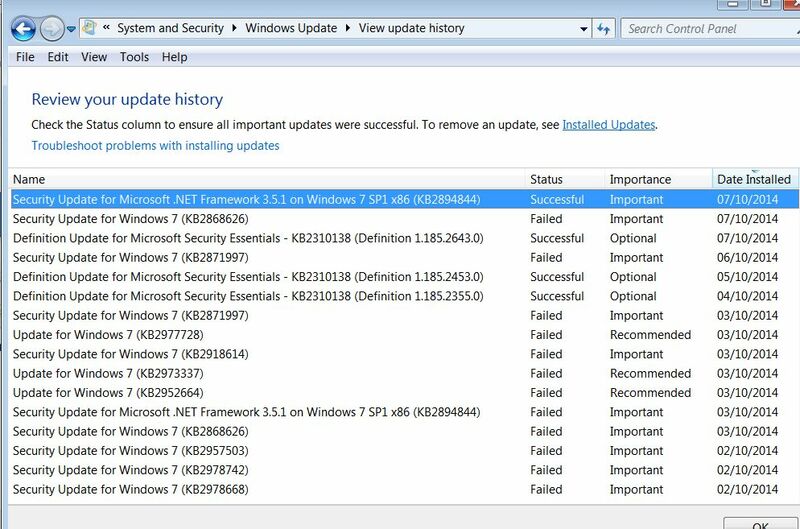 Hi Donna, have run sfc /scannow a few times and each time the result is "Windows Resource Protection did not find any integrity violations." I think the attached is what you wanted? Hey Jane? 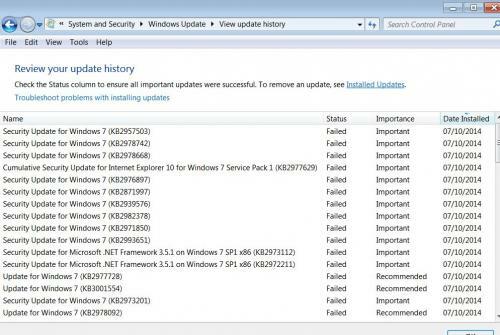 Have you tried Windows Updates since you ran System File Checker? 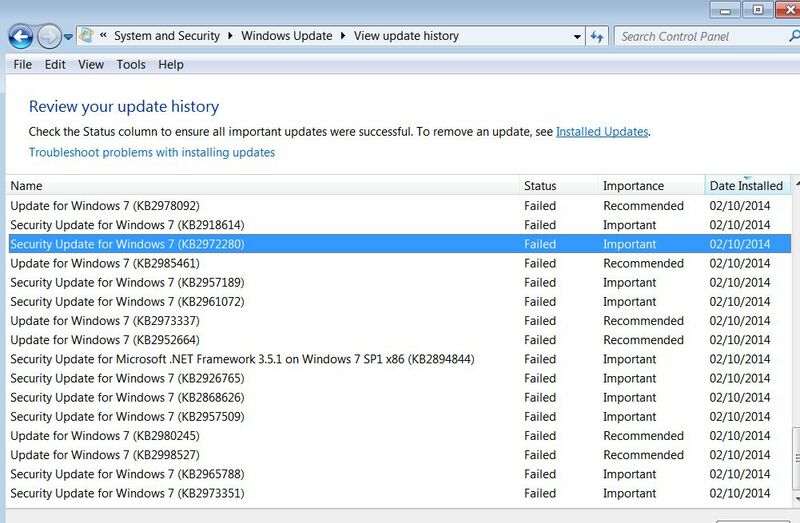 I just realized, the image of failed updates that you posted in post #1 are dated for 02/10/14 and so are the failed updates in the image that you posted in post #8. 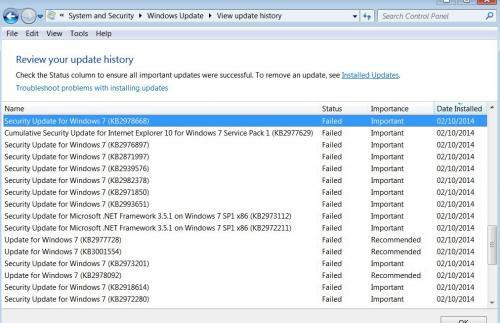 Try installing a few now and let me know what happens. 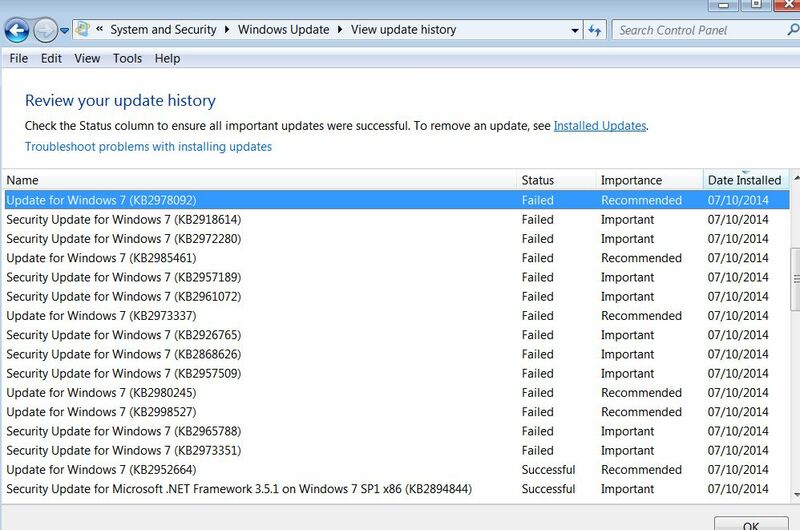 If they fail, go to View Update History, left click to highlight the failed update, then right click and choose View Details. 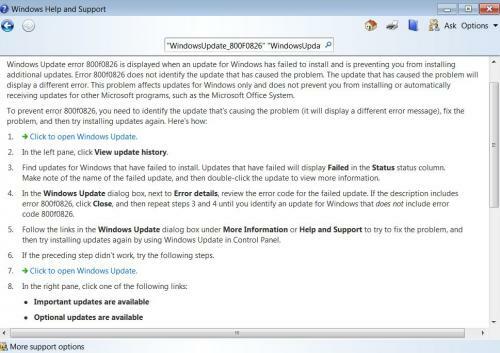 Jot down the error code and post in your next reply. Also, click on Installed Updates at the bottom left the Windows Update page, click on Microsoft Windows section and see if any of them had already installed. Hi again, I have tried updating quite a few times since the 2nd but with no luck. I've attached some screen shots of recent tries. I will do as you have asked and post the results soon. 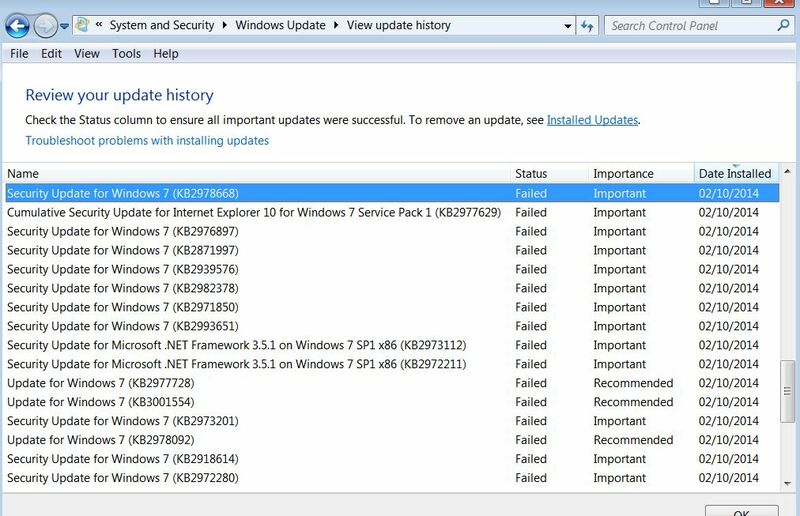 Due to so many failed updates, I do not know what one you want me to get the error code details for, can you tell me please? Any of them. Check a few for me, please. 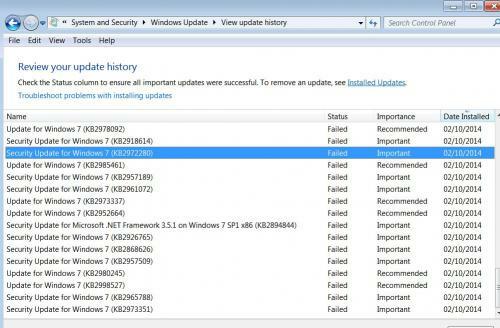 Take a moment to review the installed updates to see if any of the failed updates had installed previously. 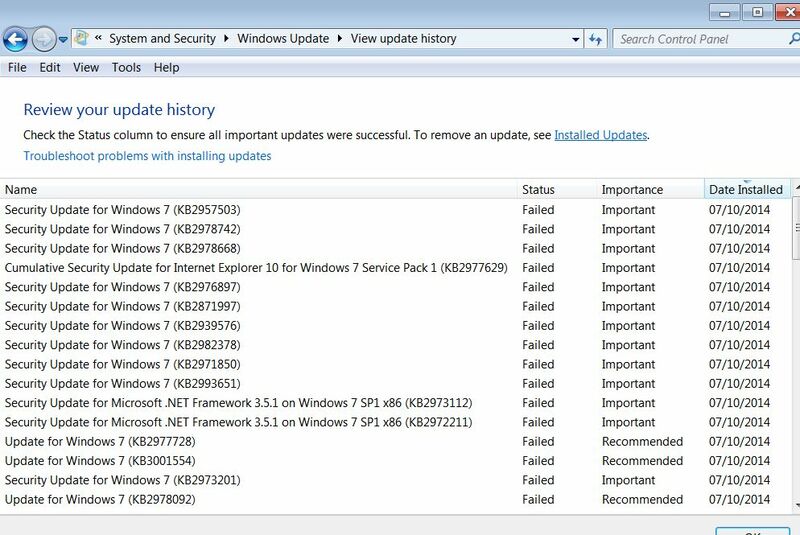 Are the failed updates the only issue with your computer? What other problems are you experiencing? In the meantime, I need to review the logs again that you posted in previous replies. I have no other problems with my pc. Edited by Jane Milburn, 09 October 2014 - 07:03 PM. Please download Eset SysInspector and save to your Desktop. Right-click on SysInspector.exe and select Run as Administrator. Read through the EULA/scroll down at the prompt and click on I Accept. Your system will now be scanned, this may take some time. When the main SysInspector GUI(graphical user interface) appears, navigate go to the File drop down menu and select Save Log. At the prompt click on Yes and save the Zip File to the desktop. Please attach SysInspector-**** ******- **** ( * denotes computer name/date/time) in your next reply for myself to then download and research. Sorry for the delay in responding. I have invited the assistance of a fellow associate to review your thread and the logs with me to see if he can spot what I may have overlooked. Please allow us some time to review and discuss your topic. I'll post back as soon as possible. In the meantime, I know how frustrating this must be for you. 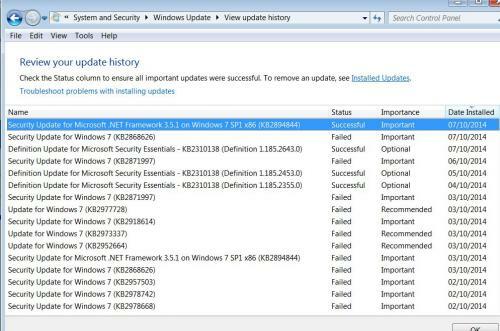 Please do not try any fixes that may change the system as it is or our efforts might be fruitless. There is no need to apologise as you are doing so much to help me. I have lots of patience so please take your time. I promise to only do as you advise me. Many thanks again. More work for you to do. I would like to see the whole CBS folder this time. Click the Start orb -> then click Computer. Double-click on the C: drive, under the Hard Disk Drives category, and then scroll down to, and double click on the Windows folder. Find and double click on the Logs folder. Right click on the CBS folder and choose Copy. Now go to your desktop and choose Paste. Once on the desktop, Right click on it and choose Send to > Compressed (zipped folder). Please attach this to your next reply. Note:: If the file is too big to attach to your next reply, please create an account an account and upload to Dropbox and provide the link, unless you have another online storage account, that would be fine.